Black Friday is a big day for Holiday shoppers, and at Best Buy it’s a big day for deals. New this year, eight deals from the ad are available now on BestBuy.com and when stores open this morning. Dozens more will be available when stores open at 5 p.m. on Thanksgiving. For customers who prefer to shop from home on Black Friday weekend, BestBuy.com will continue to offer great deals. 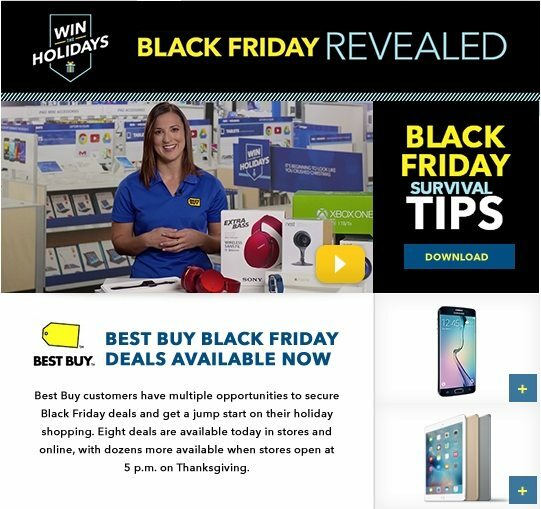 Online “doorbusters” and almost every item in the Black Friday ad will be available for sale on BestBuy.com throughout Thanksgiving Day, with additional deals available all weekend long. This year, online shoppers can take advantage of free shipping throughout the holiday season with no minimum order required and convenient in-store pickup options.